Effective skin care with apples! From May to July ultra-violet (UV) rays pose the biggest threat to your skin. One must take proper precautions as the season approaches. Why not use apples to fight harmful UV rays! The most effective skincare agent in apples is polyphenol. When humans get struck by UV rays, an active oxidant develops and accelerates aging of the body. Apple polyphenol works to prevent rough skin and wrinkles by restricting the formation of oxidants. The polyphenol from apples is called procyanidin and has a strong antioxidant effect. To protect your skin, it is suggested to use polyphenol in and outside your body. Apple polyphenol is contained in and just under the skin. Therefore, it is important that apples are eaten with their skin. Along with eating raw apples, smoothies with vegetables and apple salads are great ways to eat them. We have many delicious apple recipes on our Apple University website. Please take a look! Apples contain large amounts of fruit acid. This acid dissolves protein to remove pore clogging dirt and keratin, as a result it helps retain moisture by promoting metabolism of the skin. Not only eating apples, but also applying them directly to your body, can help you obtain a smooth and fine complexion. How about making your own skin pack with grated apples with even more skin-effective ingredients! You can expect a synergistic effect from both apples and other ingredients. Mix grated apples and yogurt to whatever ratio you wish. Apply it on your skin, leave for 10 to 20 minutes and wash it away. Vitamin A and B will work to make skin more supple and radiant. Honey is said to have a moisturizing effect. A Ten to 20 minute pack will leave you with smoother skin, especially for those who have trouble with rough skin. Honey also has a high anti-bacterial power to prevent pimples. Mix grated apples with flour appropriately. After mixing well, apply it and let set for 10 minutes. Wash it away gently. The apple effect of removing keratin and the flour effect of removing pore clogging dirt will revive your skin. Although it doesn’t contain any cosmetic components, there is a product using Distilled Apple Water with the fragrance of apples. 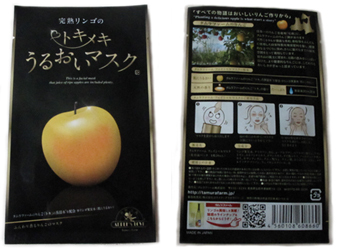 『Tokimeki Moisture Mask of Fully Ripened Apples』 is made with Distilled Apple Water. Only Toki apples, rich in aroma, are used, so you will be surrounded with a gentle, sweet and refreshing fragrance. The skin will be moistened while you enjoy the aroma. When you want to relax, reward yourself, or give it to someone special, please try one. It is available in stores at the Hirosaki Apple Park, Hirosaki Tourist Center and other major tourist sites in Aomori Prefecture. Apples are an excellent food in terms of nutrients in and out of body. Beautiful skin is an evidence of good health. Why not aim for healthy and lively skin making a good use of apples. Of course the virtue of apples is not only in skin care.Apples have many other powers that are very beneficial to us. Eat apples every day to keep in good health and stay beautiful.